The Chairman of the All Progressives Congress (APC) in Kogi, Alhaji Haddy Ametuo, says “some ghosts “ initiated the recall process against Sen. Dino Melaye. Ametuo, who stated this in a statement issued in Lokoja on Sunday on the botched recall process, expressed delight that the efforts had come to a premature end through the collective will of the people of Kogi West Senatorial District. 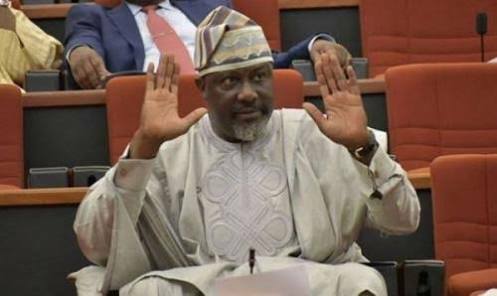 “Melaye, the only senator our party has in Kogi State, won with 94.66 per cent leaving the remaining 5.34 per cent to the petitioners. “ The messages are very clear; that Sen. Melaye is the most popular senator ever produced by Kogi West,” the statement said. The APC Chairman commended the high level of neutrality and transparency displayed by the Independent National Electoral Commission and other stakeholders throughout the exercise. next 2019: "Those asking Buhari not to run are his well wishers"